Build a web portal for customers to pay online. Save invoices to send via email or snail mail. There are two options for creating invoices and supplying them to your customers using Knack. A web portal allows users to login or enter an account number to view an invoice assigned to their company or personal account. The business manager, or creator of the invoice, will complete an invoice or order form to create the invoice. Enabling e-commerce in your app will allow your customers to pay via credit card using Stripe or PayPal. Customer Payment Portal - View and download an example of a completed customer payment portal. About E-Commerce - Learn how to integrate e-commerce in your app. If you prefer to send invoices via email or standard mail, you will want the option to print an invoice. 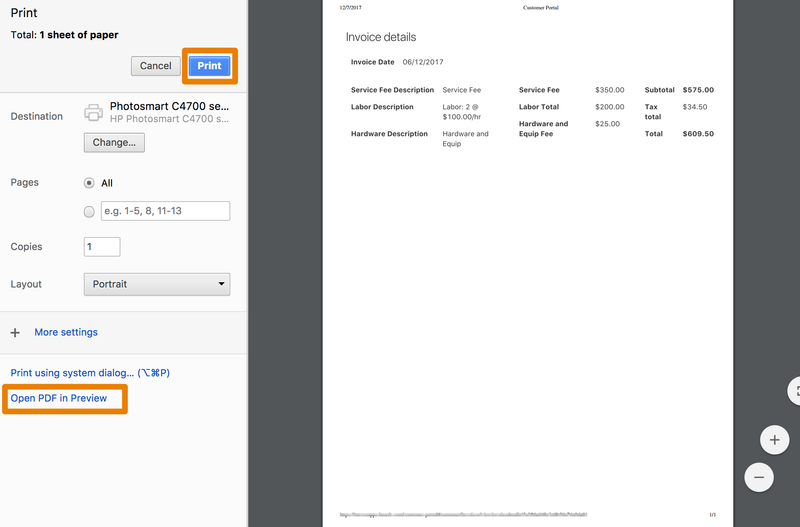 Using Knack, you can print or create a PDF from your invoice page. The PDF option will save the document to be attached to email or printed at a later time. Click here to learn more about printing and PDFs.